Re-view! Ahh... sounds of songbirds, visions of fresh green hues. As a long winter's sleep fades away, these are a few of the things we enjoy each Spring. You too can cherish this season of surprise with a refresh in your home's textiles. Seasonal hues such as Pantone's 'Greenery' - symbolizing new beginnings offers a refreshing launchpad. Give your warm hues, woolens and sateens a rest. Cool, crisp cotton and linen fabrics infused with light and airy patterns, florals and nature-inspired hues are begging to flourish now. During this time of growth, we've been happily busy gathering season-inspired bed, bath, table linens and home decor items. This look book proves that our designers have been inspired once again. Enjoy in celebrating Spring! Ages ago, we understood that a lovely and oh-so-comfortable bed was founded upon perfectly filled and stitched down and silk fillers. We continue to strive to make the finest down pillows, comforters and featherbeds along with DEWOOLFSON'S signature duple silk bedding. Click on any item within this look book to be taken to that page on our merchant website - dewoolfsonlinens.com where you can learn more and purchase items. We hope you'll find our Spring look book worth re-views. A single band of sea coral is embroidered atop Paradiso's white Egyptian cotton percale flat sheets and top-ofthe-bed duvet covers and shams. A soft coralcolor, blanket-stitch frames each item and creates a serene finishing statement. DEWOOLFSONÂŽ comforters, pillows, and featherbeds are individually filled and sewn from the finest materials and shipped from our North Carolina factory within 2 business days. We use only hand-select European white goose down or feather fills, covered with some of the world's finest German downproof fabrics, including your choice of cotton cambric, batiste, sateen, silk, and an eco-friendly organic cotton. Our comforters are available in up to five warmth levels, and can have additional down added anytime within a year of purchase. Our down pillows are fully adjustable for firmness within a year of your purchase (charging only for shipping and the cost of the additional down, by the ounce). As always, orders for custom sizes and fills are gladly accepted. 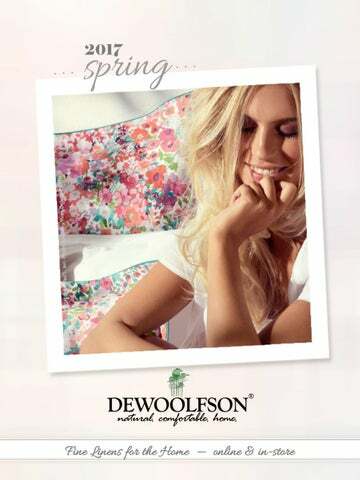 Silk-filled comforters are the perfect addition to DEWOOLFSON's line of fine sleep products. Silk, a natural insulator that stays cool in the summer and warm in the winter, is one of the oldest known textile fibers and the preferred fill for sleeping comfort in many countries. Duple is DEWOOLFSON's term for double silk. Silk filled and silk covered. Our summer weight is covered with a lightweight (13 momme weight) silk habotai cover and stitched in a traditional butterfly pattern. Our winter weight is covered with a heavier silk satin (19 momme weight), sometimes described as "buttery smooth", and sewn in a box stitch pattern. Both are filled with the finest hand-pulled mulberry silk floss. Naturally hypoallergenic. Eggshell white. SCHLOSSBERG Beautiful hand-drawn design - Liz is a visual delight with its naturalistic, opulent and abstract interplay of hue and flora. A harmonious poetry of light. 9 45 2 N C H i g h w a y 1 0 5 S . B a n n e r E l k , N C 2 8 6 0 4 U . S . A . Fresh season - re-freshing bed, bath and table linens. Come for inspiration. We strive to satiate.